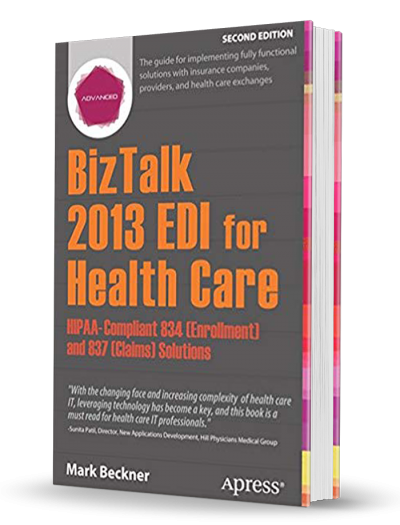 BizTalk 2013 EDI for Healthcare eliminates the complexity and demonstrates how to build both inbound and outbound EDI 834 processes in BizTalk server that follow the required patterns for integrations with these exchanges. Archiving, mapping, reconstituting EDI 837 data, exception handling and advanced logging and reporting (without the need for BAM!) are all covered in enough detail to allow you to implement your own fully functional solution. The Affordable Care Act and the requirements to integrate with state Exchanges have secured BizTalk’s role with integrations within the healthcare industry. EDI 834 documents are the heart to all integrations, dealing with enrollment and the maintenance of enrollments. In order to successfully integrate with the exchanges, companies are required to implement a number of architectural components that can be daunting and complex to work through. High-quality resources for IT professional to handle these challenges are sorely needed, and this resource has been designed to provide concise solutions.